Oklahoma Form 511X is a tax return document for residents who need to amend their previous return. Also known as the amended individual tax return form, it is used to correct any errors in income, reimbursements or tax credits on a number of other Oklahoma 511 tax documents. When filling out your 511X form, you will be given the chance to explain why you are making an amendment in your tax return. 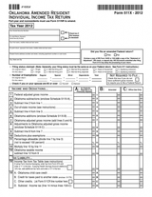 Please note: Starting with Tax Year 2013 the Form 511 will be amended by marking a check box on the Form 511.